The primary goal for this research is to develop a method of dynamic role assignment and formation control for multi-robot systems for rotationally and translationally invariant formations. Most previous work has treated assignment and formation synthesis as two separate problems. Our approach is to determine formation pose as part of the assignment algorithm. 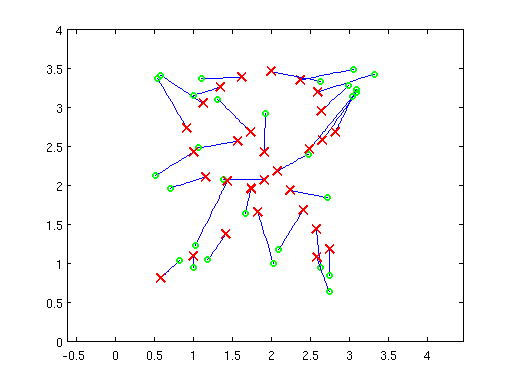 This means robots will dynamically determine the formation pose in addition to role assignment. This will allow us to apply techniques such as the hungarian alrogithm even if the formation pose is not known in advance. Furthermore, determining the formation pose during the assignment phase yields a unique point in space to which each robot is assigned. This way, formation synthesis and assignment are accomplished simultaneously without having to introduces additional control laws such as distance based formation control. Initially, the formation translation and rotation is unknown, nor do the robots know to what role they are assigned in the formation. The goal of the algorithm is to have a network of mobile robots build formations while minimizing the total distance traveled by all robots. The only information available to each robot are the relative positions of all other robots. There is no communication between robots. Since each robot has access to the same information (relative positions between robots), they independently come to the same conclusion. Robots know their position via an overhead camera system that tracks each robot and broadcasts its position over wifi.